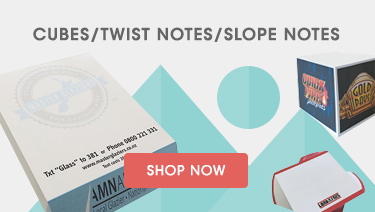 We supply Post-it® notes custom printed with your graphics, logos or images. You will find a huge range of sticky notes and 3M Post-it® notes on our website from big sized sticky pads to small sized sticky pads, all of which are imprinted and personalised in your choice of print colours, paper colours and even paper pad thickness. 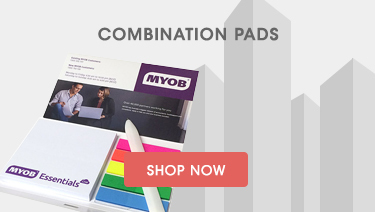 You can be sure that we will have a sticky notepad that will suit your needs and your budget. Our sticky note paper is made and printed in Australia using the latest print processes and technologies. For spot coloured prints onto sticky notes up to 3 colours, we utilise an economical, cheap printing process called offset printing. For four colours or full colour, photo printed sticky post-it notes we use CMYK digital printing. We supply all three options listed above in bulk quantities complete with your custom branding of course, deilvered direct to your door, all around Australia.